DECEMBER 28 – Following the nationally coordinated police evictions last month of Occupy Wall Street, Occupy Oakland and encampments across the country, on December 12 the Occupiers struck back. Ports up and down the West Coast were blockaded, from Seattle to San Diego and the port of Houston on the Gulf of Mexico. In Oakland, California, where 30,000-40,000 marchers shut down the port on the evening of November 2, this time hundreds blocked port entrances in the early morning and several thousand demonstrators occupied the dock area in the evening, shutting down shipping for the entire day. Key terminals were blockaded in Seattle and Portland. Solidarity rallies were held from New York to Honolulu and Tokyo, Japan. Despite a barrage of hostile propaganda in the media, opposition from union bureaucrats and heavy police repression in some places, overall the blockade was successful – this time. The port shutdown targeted “Wall Street on the Waterfront.” It was called in solidarity with longshore workers fighting a union-busting assault in Longview, Washington and port truckers seeking union recognition in the ports of Los Angeles/Long Beach. In Longview, the International Longshore and Warehouse Union (ILWU) is facing a scab grain terminal operation by the EGT consortium of agro-export giant Bunge and Japanese and Korean shipping companies. It is a make-or-break struggle for the ILWU: if EGT is successful, it would break the longshore union’s jurisdiction on the coast. The other grain shippers would immediately try to follow suit, jeopardizing health, welfare and pension benefits for the entire ILWU membership, 30 percent of which comes from the grain contracts. In L.A., Occupiers took aim at SSA Marine (formerly Stevedoring Services of America), where port truckers have been killed and nearly crushed to death due to unsafe operations. SSA Marine, 51 percent owned by the Wall Street investment giant Goldman Sachs, is the largest privately held cargo handler in the world. Class-conscious workers and defenders of democratic rights stand four-square with Occupy activists against police repression. Long before middle-class youth began camping out in city squares, working people have been fighting against, the masters of Wall Street who have shamelessly looted the economy, raking in billions in stratospheric salaries and obscene bonuses even as tens of millions are jobless in the worst capitalist economic crisis in three quarters of a century. The fact that Occupy protesters, however contradictory their politics, are taking up the cause of labor should be greeted. Many who have never before been on a demonstration are experiencing, up front and personal, the hard realities of American capitalism. Although coming from the outside, and despite the yelps from the bosses and their kept media, from the Democrats and sellout labor bureaucrats, the December 12 West Coast port blockade aided the workers’ class struggle against the exploiters. D-Day for the ILWU is when a ship comes in to move the grain stored in the EGT silos in Longview, likely in January or February (the projected date keeps getting moved back as protests multiply). ILWU Local 10 in San Francisco/Oakland has called for a caravan of longshore workers and supporters to come to the aid of their Longview sisters and brothers, a call now taken up by Occupy groups. The goal should be a real occupation of the terminal by the workers to prevent the loading of the scab cargo. And that is only the beginning. Longshore militants have called on the ILWU ranks to shut down every port on the West Coast, and for the International Longshoremen’s Association (ILA) to shut down the East and Gulf Coasts, in support of the Longview struggle. In addition, longshoremen around the globe should refuse to handle (“hot cargo”) any ship of the union-busting consortium. December 12 was a demonstration of sympathy and support, which can be tremendously helpful. But now the class war on the West Coast docks is coming to a head, and the real struggle can’t be waged from the outside. “Ready to Fight? Damn right!” chants ILWU Local 10, historically a hotbed of waterfront labor militancy. Can it be done? ILWU longshoremen from throughout the Pacific Northwest showed they were ready, willing and able last September when hundreds braved police repression and “stormed” the scab terminal, dumping ten thousand tons of grain on the tracks. Security guards cowered in their shacks and the cops beat a hasty retreat. There is a world of difference between symbolically “occupying” a plaza or intersection and seizing the means of production, as the sit-down strikes (plant occupations) of the 1930s did. That’s what built the unions in this country and elsewhere, and it will take that much and more to defeat the war on the workers being waged by both capitalist parties. Then, after Occupy Oakland called a “general strike” that shut down the port there on November 2 and a second police eviction of Oscar Grant Plaza on November 14, Occupy Oakland issued a call for a “coordinated West Coast port blockade” in response to the police raids on Occupy camps and in “solidarity with the longshoremen in Longview, Washington in their ongoing struggle against the EGT” as well as the port truckers. Occupy Seattle and Occupy Portland soon signed on. Over the next three and a half weeks, Occupy activists leafleted ports, campuses and union meetings up and down the coast. The connection with dock workers was key. Iraq war veteran activist Scott Olsen, who was nearly killed by a projectile fired by cops during protests over the first (October 26) eviction of Occupy Oakland, issued an appeal to longshore workers to honor Occupy picket lines. He recalled, “I was on my second pump to Iraq when ILWU – when you – led by your Vietnam vets, shut down the West Coast ports on May Day 2008 to stop the war.” The Oakland Education Association (OEA) endorsed the shutdown in support of the embattled port workers. It noted that even a minimal tax on a single shipping line in the Port of Oakland would be enough to wipe out school debt, lower class size, restore city worker layoffs and keep all local medical facilities open. But the OEA was the only official union body to endorse the December 12 blockade. Instead, union officialdom refused to back the shutdown, and even attacked it. This was the case notably of the ILWU International, which issued a November 21 memo stating in elaborate lawyerese that the union was “not coordinating independently or in conjunction with any self-proclaimed organization or group to shut down any port or terminal.” This was followed up the next day with a “clarification” stating ILWU officials’ “rejection of third-party calls for job actions.” Then on December 5 came a personal statement by ILWU International president Bob McEllrath warning against the “danger that forces outside of the ILWU will attempt to adopt our struggle [with EGT] as their own”! If the union leadership has any intention of standing up to EGT, this shameful go-it-alone stance is incredibly shortsighted. In any real struggle, the union will sorely need “forces outside the ILWU” to make its struggle their own. But these statements strongly suggest the union tops are backing away from an all-out fight. Following the ILWU bureaucrats’ attack, there was a full-scale ruling-class assault on the planned West Coast port shutdown. Port commissioners issued a cynical “open letter to our community” calling to “Keep Our Port Open” and playing on the Occupy slogan by claiming “the Port of Oakland is where the 99% work.” The Commission also set up a web site and spent tens of thousands of dollars for full page ads with the same message in Sunday editions of the Oakland Tribune and other Bay Area papers, and several days running in the local edition of the New York Times. Discredited Oakland mayor Jean Quan, who is now facing two recall drives, issued her own open letter accusing Occupy Oakland of “economic violence.” Forbes magazine weighed in with a piece crying that “occupying the port means ordinary blue-collar workers can’t show up to work” and “risks making enemies out of organized labor”! What touching concern for labor unity from the magazine that brandmarked itself the “Capitalist Tool”! With all this negative publicity, as local officials gathered at their command posts in the pre-dawn hours of December 12, some may have thought that the port shutdown would fizzle. If so, they were quickly disabused. 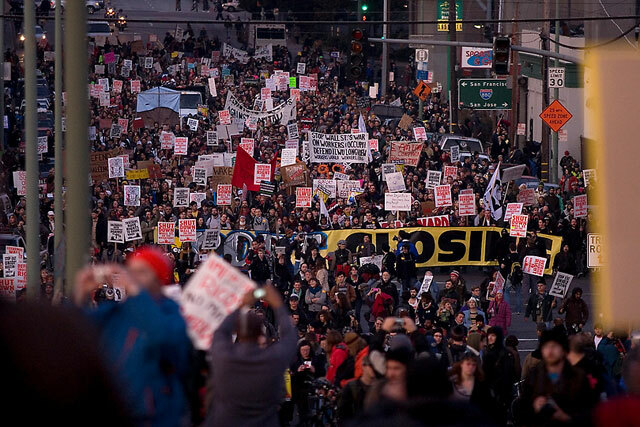 To the north in Portland, Oregon, Occupy demonstrators also succeeded in shutting down the port. ILWU Local 8 (Portland) president Jeff Smith had been particularly aggressive in opposing a shutdown. “If I wanted to shut down the port, I could do it without Occupy. I don’t need ’em,” he told the Willamette Weekly (7 December). But the membership didn’t go for Smith’s Occupy-bashing and instead respected the pickets. By 7 a.m. on the 12th, about 500 protesters were blocking the entrances to terminals 5 and 6, and by 8 a.m. they were declared shut down for the day. Riot police were present (with their badge numbers taped over), but did not intervene. Later in the afternoon, terminal 4 (the grain dock) was shut down as well and then a steel company terminal. Earlier, a train and truck were diverted as protesters risked their lives by laying down on rail tracks. A front loader operator came within a few feet of crushing them (including a young mother) before he was stopped. 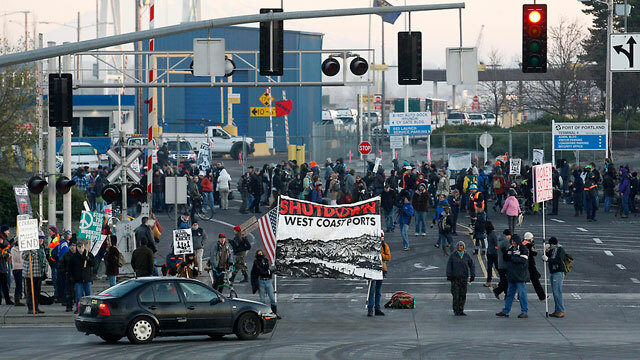 In nearby Longview, Washington some 125 Occupy protesters (including a number who came by bus from Portland) shut down the port on the morning shift. No longshore workers even tried to cross the picket line as demonstrators denounced EGT union-busting and chanted, “Occupy, shut it down, Longview is a union town.” After the arbitrator ruled that a health and safety hazard existed, a couple dozen port workers and family members returned to sympathetically watch the protest. Also early in the morning, activists blocked an entrance to the port of Vancouver, British Columbia, Canada’s busiest port, declaring “Solidarity with Longview ILWU, Port Truckers, Oakland Commune.” With a noon march and a smaller afternoon blockade, the protesters hit all three Metro Vancouver ports. The impact was limited by opposition from the B.C. Federation of Labour, although some rank-and-file longshoremen told Occupy Vancouver they were “in support of us and that we should go ahead with this action” (Vancouver Sun, 13 December). Around noon in Bellingham, Washington a dozen protesters were arrested for chaining themselves together and laying on the tracks to block a Burlington North Santa Fe train. In Seattle, a thousand Occupy blockaders were able to shut down the 4 p.m. shift at terminal 18 (operated by SSA Marine, majority owned by Goldman Sachs) and then terminal 5. Hundreds marched for three miles from downtown to the port, including numbers of high school students. Lots of support was reported from port workers and truckers waving and honking. At terminal 18, a barricade was built out of construction material, blocking the main intersection and three entrances, while the port itself shut down the fourth. After the bulk of the demo moved on to terminal 5, cops attacked the barricade with tear gas, pepper spray, flash-bang grenades and mounted police. But in contrast to many Occupy marches marked by passive “civil disobedience” and even support for the police, this time Occupiers fought back, flinging “road flares and a bag of paint” against the marauding cops. A longshoreman said it was reminiscent of battle scenes from Cairo, Egypt. To the south, blockades were less successful. In Los Angeles-Long Beach, several hundred Occupy protesters blocked the road in front of the SSA terminal for about a half hour before dawn until police pushed them back to an intersection. In addition to Long Beach and Port Authority police, LAPD riot cops and the California Highway Patrol were called in as backup while police Zodiac boats patrolled in the harbor. Driving rain kept numbers down. According to an activist who has spent years trying to organize port troqueros, most drivers waited at their base for the first three hours, until the longshoremen from ILWU Local 13 drove in a back gate. 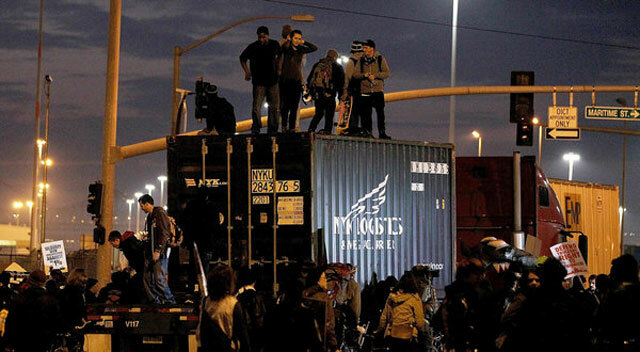 In San Diego, Occupy protesters managed to shut down two entrances to the port for an hour and a half, and blocked one of the entrances the whole day. However, the port did not shut down and longshoremen reportedly crossed the lines. Over 100 cops – SDPD, Port Authority and Department of Homeland Security – attacked the demonstrators, arresting several. At the small port of Hueneme, in Ventura County, where Dole brings in fruit and produce, the gate was reportedly picketed by about 150 protesters, some of whom drove from the Central Valley to get there. Elsewhere, cops in Houston used police horses to attack Occupy protesters. Police there used an inflatable tent to cover demonstrators so the media couldn’t see blowtorches being used to cut through PVC tubes and chains used by blockaders to shackle their arms together. Seven Occupiers face up to two years in prison for this “use of a criminal instrument”! In Denver and Salt Lake City, Occupy protesters targeted Wal-Mart distribution centers. Across the country the authorities have come up with new “legal” devices to prevent peaceful protest. In New York, Occupy Wall Street was evicted supposedly in order to keep the “public-private” Zuccotti Park open for casual strollers, but ever since it has been blocked by a double line of metal barriers. Almost everywhere it is now illegal to camp out in public parks. And in Alaska, where Occupy Anchorage marched to the port on December 12, newly passed Ordinance 2011-112 banned sitting or lying on the sidewalk, and a permit is required to build an igloo!! Objections to the December 12 port blockade came not only from the spokesmen for capital, from the Democrats and labor bureaucrats, but also from sections of the petty-bourgeois left allied with them. A lightning rod was an article covering for the bureaucracy by labor historian Cal Winslow, “The Case of Occupy and the Longshoremen’s Union” (CounterPunch, 5 December). Winslow argued that November 2 in Oakland was not a general strike, and in fact not a strike at all. We pointed this out in our 9 November article, cited above, which had the superhead, “Not a General Strike, But 30,000 Occupied the Port.” Of course, Winslow leaves out the fact that some Local 10 militants tried to turn it into a real strike, but were thwarted by the actions of the ILWU International (with the connivance of some putative leftist would-be bureaucrats in the Local). But that in no way justifies Winslow’s condemnation of the December 12 port shutdown. For starters, Occupy Oakland never called for an “American general strike” or even “a West Coast wide waterfront strike,” as Winslow falsely claimed. The initators said from the outset that it was a blockade. Winslow “confess[es] to knowing little about the officers of the ILWU, the same for the rank and file,” which is obviously true, but this didn’t stop him from spouting off either. The reason is simple: he is a straight-out defender of the pro-capitalist labor bureaucracy, despite some leftist rhetorical window-dressing. So when the ILWU tops told “outside groups” to stop meddling in the fight over the union-busting at EGT, Winslow declares the port blockade to be “a challenge to the basic principles of workers’ democracy” and decrees, “It must be abandoned.” The bottom line is that he – like the bureaucrats, the maritime bosses, the bourgeois media, and various anarcho-liberal “leftists” – identifies the union with the leadership. But the union is the membership, not the misleaders who speak in its name. Far from asking the members if they supported the call for a port shutdown, the ILWU tops tried to slap a gag order on the Longview longshoremen. Yet Local 21 president Dan Coffman, at a November 19 Occupy Oakland march, said that “when November 2nd happened, and it was against EGT in respect to the ILWU Longview, Local 21, you cannot believe what you people did for the inspiration of my union members that have been on the picket line for six months.” All the claims that rank-and-file longshoremen opposed shutting down the port are belied by the positive reception Occupy pickets received in Longview on December 12, and by the fact that almost everywhere, except Los Angeles/Long Beach Local 13, dock workers willingly respected the Occupy pickets, as they have done on numerous occasions in the past, particularly (but not only) in the San Francisco/Oakland Bay Area. The ILWU International leadership opposed the December 12 West Coast port blockade not because it supposedly violated the democratic rights of the ranks, but because the labor fakers don’t want to shut down the coast over EGT. Instead, they are angling to cut a deal that would be disastrous for the ILWU membership. On the other hand, what’s needed to scuttle the employers’ union-busting attack is precisely action by the longshore workers to mobilize union power to occupy the scab facility and stop the loading of scab grain, to “hot cargo” all ships of the EGT consortium around the globe, to unionize the port truckers and to shut down the Pacific Coast – and the Gulf and Atlantic Coasts to boot – so that nothing moves on the docks. And that cannot be achieved by a one-day blockade by sympathizers on the outside. It requires hard struggle on the inside to defend the union by ousting the sellout pro-capitalist bureaucracy that is presiding over the destruction of the unions. Various arguments have been put forward by defenders of the Occupy “movement” against the attacks on December 12. The International Socialist Organization’s Socialist Worker published a couple of articles of the “Gidget goes to the port shutdown” variety, denying there was any problem. The first (8 December) argued that “there's no sharp divide between Occupy activists and ILWU members and other workers who are also organizing to build awareness of the community picket,” and “the December 12 call to action is a grassroots effort to deepen the links between Occupy and longshore labor.” A wrap-up article (13 December) claimed that “rank-and-file members of both the ILWU and Teamsters were part of the organizing for December 12 and well represented on the picket lines.” The reality is that while a few dock worker militants joined in, participation by the ranks was minimal, and the Occupy Oakland call for a West Coast port shutdown was not consulted beforehand with longshore activists. Many of those active in the “Occupy movement,” particularly in the Bay Area where it has had a more leftist flavor, see it as giving a kick in the pants to a labor movement that has for too long sat on its duff. Some may be so deluded they think they can call for labor action and it will miraculously appear. So far they have lucked out, the next time … who knows? But the basic problem with the December 12 port blockade is not that super-radical adventurist-substitutionist Occupiers ran roughshod over the unions, but rather that with their liberal/reformist/populist outlook, Occupy non-leaders are too soft on the union bureaucracy. They sought to go around this obstacle to sharp class struggle, when what is needed is a fight to defeat and drive out these “labor lieutenants of the capitalist class,” as American socialist Daniel De Leon accurately described them over a century ago. Boots Riley, of the Bay Area hip hop group The Coup, who was the lead spokesman for the port shutdown and proudly describes himself as a communist, stood up to the bad-mouthing by the ILWU tops, saying “No one has a copyright on working-class struggles” (New York Times, 13 December). However, commenting on a report in the Portland Tribune (29 November) he said, “National leadership is trying to avoid a lawsuit. That is all.” Actually, that’s not all. Certainly that has happened in the past. But in this case the ILWU International’s repeated disavowals were not a wink and a nod, but outright opposition. Not only did it talk of sinister “outside groups” with “their own agendas,” it went out of its way to specify that if longshoremen did stand by, they must wait in areas under “the Employers control” until the arbitrator rules. ILWU flack Craig Merrilees denounced Occupy protesters as “disrespectful, arrogant and misguided,” and led by “extremists that are driving away allies and marginalizing the movement” (London Guardian, 9 December). And in L.A., the Local leadership worked with the police and bosses to undermine the blockade. Why don’t Occupy leaders recognize this? Because at bottom they are no more prepared to fight the capitalist system than are the union bureaucrats. Kari Koch, a spokeswoman for Occupy Portland, told the Willamette Weekly, “The legal reality for ILWU is they would open themselves up to being sued” if it endorsed the port shutdown. “We totally understand that they are not allowed to do that.” Same refrain from the ISO’s Socialist Worker: “even ILWU members who sympathize with Occupy's call for a December 12 action must operate under the constraint of a union contract that bans strikes.” This legalistic crap alibis the pro-capitalist union misleaders. Sure, if the unions shut down the ports they could be hit with lawsuits, union officials could be jailed, Homeland Security would scream “terrorism,” the Pentagon might even militarize the docks, as it threatened to do in 2002 as the U.S. prepared to invade Iraq. If you are not prepared to stand up to such threats you cannot defend workers in the U.S. today. The fact, as any serious trade-unionist knows, is that virtually every effective labor action has been outlawed by the bosses’ government. “Hot cargoing,” “secondary strikes,” flying pickets, mass pickets, plant occupations – the tactics that built the industrial unions in the 1930s were declared illegal under the 1947 “slave labor” Taft-Hartley Act. When Jimmy Hoffa negotiated the first Master Freight Agreement organizing over-the-road truckers, the 1959 Landrum-Griffin Act was passed to go after the Teamstgers – for “corruption.” When Transport Workers Union Local 100 struck the New York City subways in 2005, the union was hit with million-dollar-a-day fines, the members with $1,000-a-day fines, the dues checkoff was canceled and the union president was jailed under the state’s Taylor Law. This is not new. When the IWW was active in the Pacific Northwest in the early 20th century, unions themselves were proscribed under state “criminal syndicalism” laws. The answer is not to cower before the legal machinery of the class enemy, but to organize mass labor action with the power to bring the bosses to their knees. An effective strike is not a “flash mob,” a spur of the moment thing. A strike is a collective action by the workers themselves, and it requires serious preparation. In 2008, the ILWU struck against the war on Iraq and Afghanistan, a first-ever strike by U.S. workers against a U.S. imperialist war. ILWU Local 10 had passed repeated resolutions calling for strike action against the war ever since its members were victims of a cop assault on antiwar demonstrators in April 2003. The Internationalist Group, which had been calling for workers strikes against the war since the U.S.’ 2001 invasion of Afghanistan, worked for several years with longshore militants in this effort. But after the Democrats took control of Congress in 2006 and the war continued unabated, opinion shifted and the ILWU as a whole signed on. Even then, the 2008 May Day strike was the result of months of preparation, including a November 2007 national labor conference to stop the war, held in the Local 10 union hall, so that the ILWU would not be isolated. And when the inevitable counterattack came, as the PMA accused the union of violating Taft-Hartley with this overtly political strike, the union pointed out that maritime bosses could face mounting strike action as a new contract was negotiated. Oust the Bureaucrats, Break with the Democrats, We Need a Class-Struggle Workers Party! To prepare and carry out such powerful workers action means overcoming the resistance and outright sabotage by the union tops, and to replace these sellouts with a leadership with the program and guts to wage real class struggle. The Occupy movement has no intention of doing that. Barucha Peller, an anarchist in Occupy Oakland who was active in organizing the port shutdown, was quoted in a posting on Salon.com (Emily Loftis, “Occupy vs. Big Labor,” 9 December), saying: “It’s not our job to rail against union leadership…. We don’t have to come out and criticize union leadership, because we’re leading by example. The occupation movement being able to provide a better framework of getting the rank-and-file working class’s needs met.” A better framework? The places where the ports were shut down on December 12 were mainly where the cops were under orders not to attack. With some halfway serious police repression, and contrary decisions by the arbitrators, the outcome would have been very different. Leon Trotsky, in his essay “Trade Unions in the Epoch of Imperialist Decay” (which lay unfinished on his desk when he was murdered by a Stalinist assassin in 1940), noted that the common feature in the degeneration of trade unions the world over is “their drawing closely to and growing together with the state power.” We see this dramatically in the longshore struggle. On December 5, a motion was presented to the Alameda Labor Council by Victor Uno, business manager for International Brotherhood of Electrical Workers (IBEW) Local 595, calling not to endorse a port shutdown on December 12. The motion had been approved by the ALC executive committee. Yet note that Uno is also a commissioner of the Port of Oakland – a representative of management – and ALC executive secretary-treasurer Josefina Camacho, who pushed hard for the motion, is his wife! Here we see the growing together of the state, the employer and the labor aristocracy en famille. For that matter, the ILWU Coast Committeeman in charge of negotiations with EGT, Leal Sundet, was formerly a top manager in the Columbia River region for the bosses’ Pacific Maritime Association. And in the L.A./Long Beach area, in the days leading up to the blockade, David Aryan, the former president of Local 13 and former ILWU International president, went to an Occupy San Pedro meeting and warned that if they try to shut the port down, Homeland Security would be deployed. So this former Maoist, who was recently appointed to the L.A. Port Commission, in his first act as commissioner sought to intimidate Occupy activists on behalf of the maritime bosses and the local, state and federal police. Such treachery has consequences. Now the bourgeoisie is using the wretched role of the ILWU leadership in an effort to out outlaw any port shutdown, which would clearly include workers’ strikes. While the Oakland City Council turned down a resolution to that effect on December 20, but they will certainly try again, perhaps at the federal level. Only solid union action can deter them. The enemy is not just right-wing Republican reactionaries. The banks were bailed out by liberal Democrats as well. Democratic president Barack Obama, whom many Occupiers and longshore workers voted for, got his start with hundreds of thousands of dollars of seed money from Goldman Sachs and other Wall Street bankers. The West Coast occupations were dismantled by “progressive” Democratic mayors Mike McGinn (Seattle), Sam Adams (Portland), Jean Quan (Oakland) and Antonio Villaraigosa (Los Angeles), according to a plan orchestrated by Obama’s Homeland Security Department. The deregulation of freight transportation, which destroyed the port truckers unions, was championed by liberal Democrat Ted Kennedy and populist Ralph Nader. And the drive for increased port “security,” like the TWIC (Transport Worker Identification Credential), which has victimized longshoremen and port truckers alike, was led by Democrat Charles Schumer, the “Senator from Wall Street.” While meekly criticizing the TWIC, the ILWU tops opposed and blocked Local 10 motions to stop implementation of TWIC through union action by all of maritime labor. For its part, Occupy Wall Street talks of capitalism and even revolution, but has proposed at most some minimal reforms. Although the media portrayed them as wild-eyed leftist radicals, politically the common denominator of the diverse forces involved, ranging from anarchists to liberals and conservative “libertarians,” is bourgeois populism (see our analysis of OWS, “Expropriate Wall Street Through Socialist Revolution,” The Internationalist, 14 November). As Marxists we insist that the fundamental dividing line in bourgeois society is not between the “1%” of super rich and the “99%” of everyone else, as OWS portrays it, but the class division between the capitalists and the workers, along with other sectors oppressed by the ruling class. To go beyond protest and resistance to defeat the bosses and their state, the working class must use its power at the point of production: if the repressive forces crack down, the workers can “throw the switch” and really shut it down. But that is something the bureaucracy will never do. See “Showdown on West Coast Docks: The Battle of Longview,” The Internationalist, 4 November 2011. For further information on the situation of port truckers, see the report of the National Employment Law Project, Big Rig: Poverty, Pollution, and the Misclassification of Truck Drivers at America’s Ports (December 2010). See “Tens of Thousands March to Defend Occupy Oakland,” The Internationalist, 9 November 2011.